Do you love the feel of a fountain pen? After centuries of writing with quills dipped in ink, people in the 1800s began embracing fountain pens with internal ink reservoirs that were filled with eyedroppers. Almost until the end of the century, fountain pens were notoriously fickle devices. They routinely leaked and the flow of ink onto the writing surface was uneven. Is there a perfect pen? Fountain pens have always served as the quintessential combination of beauty, tradition, and dexterity. But did you know they’re also tools of environmental consciousness? Join our tour of the fountain pen’s history, infinite varieties, and remarkable powers. With tips for shopping and maintenance. Thirty-two years ago, when I was a young writer struggling to pay the rent and eat, I walked into an art supply store in San Francisco and put down $120 for a pen. My friends thought I was nuts: that was, literally, half a month’s rent, a month’s groceries. A pack of ten ballpoint pens went for a buck; what on Earth was I thinking? 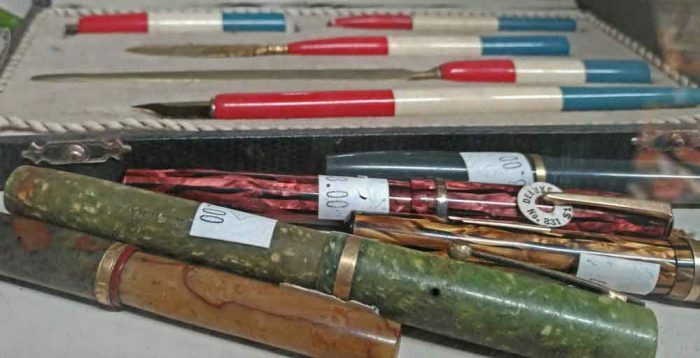 Collecting fountain pens has its own vocabulary, just like any other collectible. CLICK HERE for the basics of fountain pens. A fountain pen nib is the metal writing point at the end of the writing instrument. Virtually all quality fountain pens use solid gold nibs, both for their durability and for the smoothness of the writing experience they provide. Cheaper steel and gold-plated nibs, on the other hand, have a tendency to deteriorate and are harder to customize or repair, whereas a solid gold nib can last a lifetime (and more). Like all wonderful things, there is a great deal to learn. If we whet your appetite, then stop by and see what we have. We’ll be watchin’ for ya!